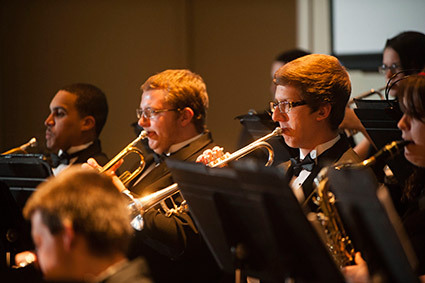 University of Lynchburg’s instrumental and choral music programs are growing at an impressive rate; a master’s in music program is attracting students from around the world; community partnerships are introducing children to the joys of music; and national accreditation is on the horizon. “We’re still a work in progress, but we’ve come a long way,” said Dr. Cynthia Ramsey, chair of the Music Department. Dr. Ramsey attributes the growth to Dr. Oeida Hatcher, former chair of the Music Department and now dean of the School of Communication and the Arts, and Dr. Jong Kim, professor of music and program director for the M.A. in Music. Both are sought after as guest conductors, adjudicators for band and choir competitions, and as presenters at conferences. The B.A. degree in music prepares students to become professional performers or music teachers. At present the College offers majors in instrumental and vocal performance, and music education with instrumental or vocal concentrations. Minors include general music, music for children, music history, and performance. The M.A. in music provides advanced training in choral and instrumental conducting. The intensive summer program is one of the one of the few summer programs available anywhere, making it attractive to professional musicians who want to keep working while getting an advanced degree. Students come from Central Virginia and from as far away as Greece and Korea.